AmeriCorps Summer Youth Corps Leaders spend the summer living outdoors and leading youth in outdoor service projects. Each crew includes eight youth led by two AmeriCorps leaders who supervise young people in a rigorous program of work, education and training. AmeriCorps leaders are trained for three weeks, before youth join the program, at the program’s base camp. After three days of youth orientation, AmeriCorps leaders lead youth on one- to three-week "spike" projects where crews camp in tents, prepare their own meals, and complete work projects. Projects may include volunteers and are completed in partnership with public agencies such as the Department of Natural Resources. Service projects include trail construction and maintenance, foot bridge building, landscaping, campsite development, invasive species removal and other projects that restore natural habitats and improve public access to outdoor recreation. AmeriCorps leaders also lead educational activities during the work day and on evenings and weekends, along with recreational activities. 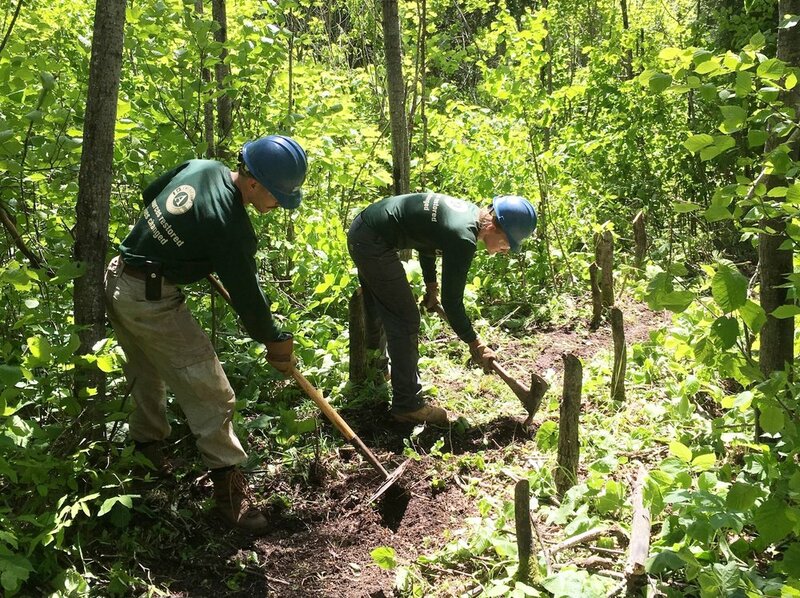 AmeriCorps leaders are responsible for encouraging the development of good work habits and basic skills such as work safety, environmental knowledge and “leave no trace” principles. Work hard and camp and live outdoors for extended periods during hot and cold weather, rain and other seasonal conditions. Lead youth in conservation, education and recreation and maintain discipline. Foster strong work habits, environmental ethics, youth leadership and team unity. Display a positive attitude and desire to make a difference with service and community work. Previous experience in youth development or natural resource management is not required but preferred; 15-20% of the service term is dedicated to technical and personal-skills training. A valid driver's license and good driving record is required. AmeriCorps leaders receive training in youth leadership, civic engagement, Wilderness First Aid, natural resource management, and other work and personal development skills. AmeriCorps leaders also receive a living stipend every two weeks ($1,355 per month), health insurance, food and lodging, and upon successful completion of the program will be eligible for an AmeriCorps Education Award ($2,960). ASL interpreters are strongly encouraged to apply. For interpreters, certification is preferred but not required. Interpreters also serve as AmeriCorps leaders during the summer and have the opportunity to foster positive relationships between deaf and hearing members of their crew. Internship requirements may be fulfilled by an AmeriCorps service term. Applications for 2019 Summer Youth Corps Leader and Field Operations Corpsmember positions are now closed. Visit our application page to view our other open positions! View the Crew Leader Manual for additional information about the program and crew leader position. Also, check out the Youth Crew Member Handbook, which is geared towards 15- to 18-year-old youth who apply for the program. Read about Teresa, who served as a Summer Youth Corps Leader.